THEY’RE at it again. One year on from the first phase of their desecration/destruction/defacing (choose your own description) of the Old Course in St Andrews, the design/set-up/architecture experts also known as the Royal & Ancient Golf Club and their accomplice/partner-in-crime/adviser (choose your own level of distaste), Martin Hawtree, last week embarked on phase two of their demented/unbalanced/misguided (choose your own euphemism for “incredibly arrogant”) “improvements” to golf’s most iconic and storied venue. Over the last decade or so, the R&A have been busy “bolstering” all of the historic links on the nine-strong Open Championship rota. And, so far, reviews have been at best mixed, at worst contemptuous, to the point where informed individuals openly questioned the ruling body’s ability and/or knowledge in the area of course set-up and design. For example, posting on the website GolfClubAtlas just the other day, renowned architect Tom Doak called the R&A’s Old Course meddling “Machiavellian”. Doak wasn’t more specific in his view, but it’s a safe bet that much of his obvious antipathy stems from the fact that the vast majority of this re-design nonsense has come about because of the R&A’s inability and/or reluctance to adequately keep pace with the explosion in ball and club technology. Had golf’s most-famous all-male club and their blue-blazered sidekicks at the United States Golf Association fulfilled their regulatory function in anything like a sensible and timely fashion, changes to the likes of Muirfield, Hoylake, Turnberry and Royal Birkdale would have been unnecessary or, at least, kept to a minimum. It is both difficult and depressing to imagine how much all those new tees and bunkers have cost in both money and hours. It gets worse, though. If this year’s Open at Muirfield is anything to go by, the organisers can’t even be trusted to follow their own advice when it comes to the presentation of a “tournament course”. On the first day of the Open, following weeks of almost constant sunshine, the course and greens were firm and fast. In other words, close to perfect for the playing of links golf. Unfortunately, however, the R&A, as ever cowed by the silly distances modern professionals now hit the ball with 3-woods, never mind drivers, chose to distort that happy state of affairs (and keep scores up) by placing pins in what can only be described as silly places. Despite being warned it would lead to chaos, the holes on the 8th, 15th and 18th greens (to name but three) were cut in spots that saw players putting either off the prepared surfaces or so defensively as to ruin the spectacle for spectators. Former US Open champion Geoff Ogilvy was just one luminary reduced to lagging from no more than ten feet away on the 18th. Do we really want to see the world’s best reduced to such meagre ambition? Just asking. Most egregious, however, was what went on at the 15th hole. 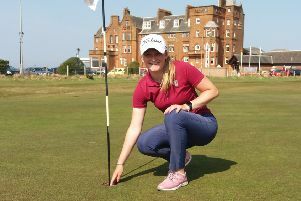 On perhaps the most interesting and fun green on the course, the R&A – in their finite wisdom – decided to cut the hole in a place where putts would inevitably trickle on and on before finishing on the fringe. It was, according to one prominent player, “a bit of a farce really”. So what did the R&A do next? Instead of simply choosing more sensible pin positions (note to the pedantic – not “hole locations”), the decision was clearly taken to flood or at least heavily water the green and its approach. By the end of the championship, balls were landing short of the putting surface and, instead of bouncing and rolling as they had done on day one, stopping virtually dead. So much for “significant changes” being “undesirable”. Anyway, back at St Andrews, it is surely with great trepidation that the world of golf awaits the results of the aforementioned “phase two”. Verdicts on the work already in place have inevitably ranged from outrage to point-missing acceptance, the latter’s adherents citing the fact that change has always been part of the Old Course’s long history. Which is true. But never before has that change been provoked by incompetence rather than progress. Perhaps most laughable has been the alteration to the 11th hole. Slicing the top off the slope towards the back-left portion of the green was designed to provide options beyond the traditional pin-position behind the Strath bunker. Which is fine in theory. But the changes did little to prevent the halting of play during this year’s Ladies British Open. On no more than a moderately windy day, balls were moving on the new, super-duper 11th. And that was the “funny” part. With the slope supposedly eliminated from the equation, the problem was obvious – the speed of the green. Wouldn’t it have been easier to fix that rather than mess with centuries of history? Where does it say in the rulebook that every green must be the same pace (an impossible aim anyway)? Again, just asking. Then there are the new slopes and humps and bumps left of the 17th green. Ostensibly designed to bring the infamous Road Hole bunker more into play, the more immediate effect has been to eliminate the “long and left” approach. In other words, an option has been eliminated. On the Old Course. On the ultimate strategic links. Amazing. As for the ongoing work, more questions arise. Why, for example, is the already difficult 4th hole being messed with? Three years ago, when the Open was last played at St Andrews, the 4th was the fourth most difficult hole on the course and played to an average score of 4.25, a figure that is apparently not nearly high enough for the R&A. The introduction of more humps and bumps to the right of the 4th, 6th and 15th greens seems equally unnecessary, but not surprising given Hawtree’s seeming obsession with such undulations on the Trump course in Aberdeenshire. Another question. Should the R&A copy anything Donald Trump does? Again, just asking. One last thing. The short par-4 9th is also going under the knife this winter. In order to make it more difficult to drive the green, a bunker is to be introduced left and short of the putting surface. Yet again, the aim is to make the hole and course more difficult. Not more fun and more interesting to play and watch – just more difficult. But does every hole have to be tough? Is it not OK to throw in an easier one now and then? Yet again, just asking. A few years ago, Peter Dawson, chief executive of the R&A, opined that tampering with the Old Course would be akin to “putting a moustache on the Mona Lisa”.